"...father, brother, teacher, friend...a mentor"
A Mentor is one who shares his wisdom, knowldge and experience with an apprentice. Someone you can trust to tell your inner most fears and hopes. Someone you know will act in your best interest. Not everyone is worthy to learn these secrets. Only a chosen Few. Every individual must grapple with how they are going to live their lives and conduct themselves. As we take in information, evaluate life experiences, observe, think, reason, and subject what we take in to our cognitive processes, we will draw conclusions. These conclusions are subject to reevaluation from time to time as we take information in from various sources. The advantage the Mentor has is age. Very often, experiences that are new and frightening to a novice, are old hat to the Sage. There is an excellent movie written by Bruce Lee in which the hero meets his hidden teacher who seems to do bizarre things. When he demands an answer, why he did this or that seemed to make no sense, the master replied, "I knew." And the student realized that the teacher had passed along this trail before, so he knew what was coming and was able to be prepared for it. "How many times?" the mentor asked his apprentice. Then he slapped him on the cheek, so he would remember his foolishness and lack of trust in the teaching; which, he explained later on, "the student and the teacher, so called, create together." A mentor should stress to the one being mentored that they should pursue a well lived life. This means many different things to many different people, but each person should pursue that path which will make their lives meaningful to themselves and others. As we mentor, we should strive to see positive changes in young people. We should act as both path finder assistant and course corrector. As mentors who are martial arts instructors we will want to guide our students through the martial art we are teaching. We will want to see them progress through the various requirements for rank. We want to make sure that they learn the martial arts in a deep and meaningful way, and not just pass the test to earn higher rank. We will want to teach students that living the martial way is a life style of honor, respect, and treating others well. 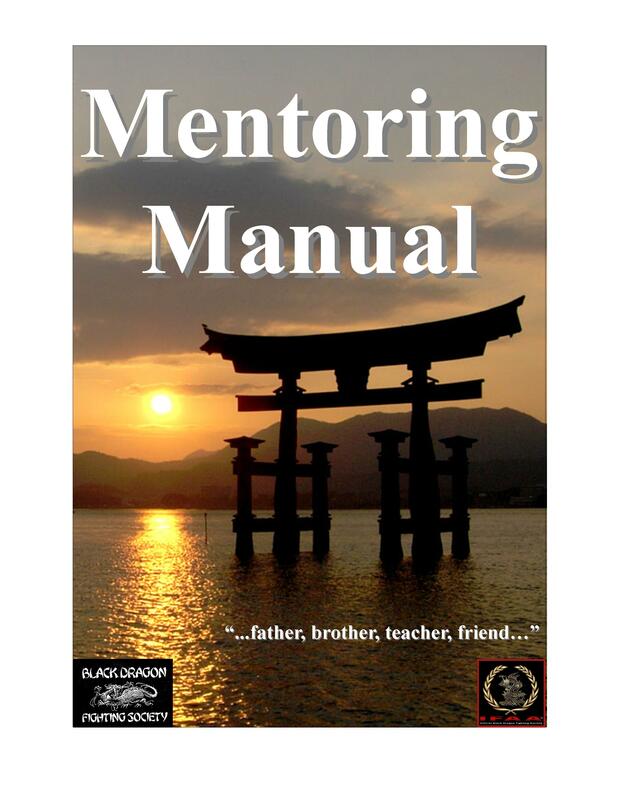 The purpose of this handbook is to provide the Mentor with useful techniques and guidelines for setting a good example and helping others with a Mentoring Program. This is a Certification Course sponsored by our martial arts fraternity. Those wishing certification as a Mentor trained in our Program may apply by answering a dozen questions based on the information provided in the Handbook and a one-time-only fee of $15. We are a fraternal order representative of the blending of martial art culture and legacy. The IFAA/OBDFS membership represents a circle of influence composed of intersecting yet diverse martial art cultures, lineages and legacies, working together to make the world a better place. orders, please add $12 per order for shipping. US Funds Only.